The first local dates exhibition organised by the agricultural sector of the Ministry of Municipality and Environment opened here yesterday evening. A number of farms and local companies are participating in the exhibition, which is being held in the western square of Souq Waqif. There are 910 active farms in the country, most of them growing and producing different types of dates. There are more than 500,000 palm trees in the farms. The total cultivated area of date palms in Qatar is estimated at 2,350 hectares, while the total production of dates reached about 30,000 tonnes last year. HE the Minister of Municipality and Environment Mohamed bin Abdullah al-Rumaihi told reporters after the opening of the exhibition that the Qatar has achieved 87% self-sufficiency in dates, adding that the exhibition would encourage farmers to market their produce. The minister noted that the exhibition is an initiative that was launched in accordance with the directives of His Highness the Amir in support of farmers, and expressed the hope that the exhibition would be an international event at its next session involving the countries of the region and the world. For his part, Sheikh Dr Faleh bin Nasser al-Thani, Assistant Undersecretary for Agriculture and Fisheries Affairs at the Ministry of Municipality and Environment, said that the exhibition comes within the efforts of the Ministry to encourage local farms and support the Qatari products to reach self-sufficiency. 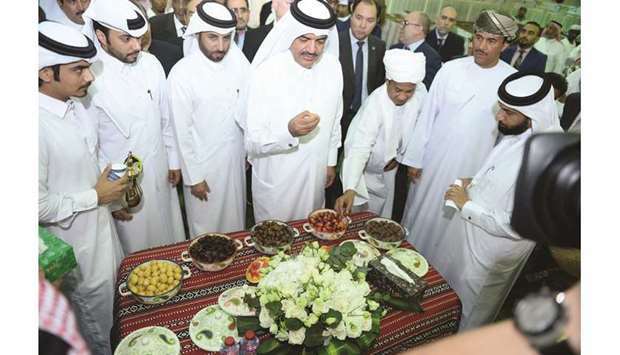 He pointed out that the exhibition showcases a number of varieties of high quality dates, and a large number of farms have been keen to develop their production of dates and to have them carefully packaged. He expected a high turnout from the public at the exhibition which runs daily from 10am to 9pm until October 22. Yousuf al-Khulaifi, Director of the Department of Agricultural Affairs, said that the exhibition will contribute significantly to motivating farmers to establish dates-related industries. He added that the Ministry is keen to combat all pests that harm palm trees, and that it has a project to combat palm weevil, and provides the detection, treatment and control free of charge for farmers and even in houses. The exhibition reflects the government’s interest in supporting and encouraging local production as well as helping owners of farms and those interested in planting dates and upgrading their varieties.